This week has been so busy and the days have passed by so fast, I had to look twice when I saw it was Thursday today. Well worth it with all the great stuff we have coming up though! As per usual we have a lot to share with you today, be sure to let us know your thoughts in the forums, there is a link to the discussion at the bottom of this Status Update. This week we kicked off our annual ‘Valentine’s Event’ and you guys and girls have not wasted any time in getting involved in daily competitions and events. The leaderboard is very closely contested and it’s still anyone’s for the taking! There are some sweet prizes up for grabs as well as a ‘Deployable Hunting Tower’ which you can get for just completing the mission pack. More details and information can be found HERE. Next week there will be a new item going live in the store, I am trying to think of some sort of hint for you to guess. However the only ones I can think of are nothing but smoke and mirrors! But if you tune into today’s Classic stream at 4pm CET, we will be using the new item and I think once all the smoke clears, you are going to love it! Tune in HERE www.twitch.com/expansiveworlds today 4pm CET. New Live Competition: Pistols at Noon! As I mentioned last week we are launching our very first Live contest that will be held on Twitch. I have some more great news to share with you all, the team have been hard at work and have developed an in-game camera that I can use to film the competition. For obvious reasons it is only available to Staff accounts, it makes me invisible to the players and animals will not spook. This should make for some very exciting footage and Graham and I will be doing our best impression of some ESPN commentators. The winners are drawn next week on Tuesday at Noon, so you still have lots of time to get yourself entered. For more details and how to enter the competition, please head HERE. Today signals the end of the competition. It has run for the last 4 weeks and there have been lots of amazing albinos shot. Thanks to everyone who entered, we might even run a similar event in the future. To have a look at the competition and how it ended up click HERE. 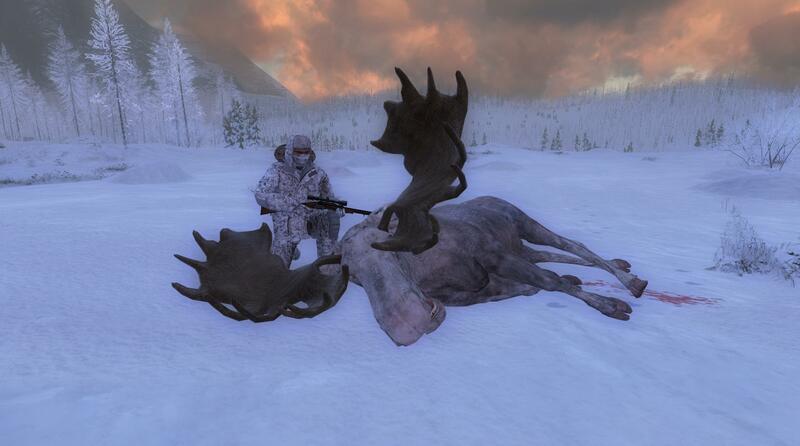 The final week’s winner is Paqer for this very nice Moose with a score of 154.348, congratulations! The new weekly social media competitions are going well and it’s great to see so many new people coming into the forums. If you have shot a rare or high scoring animal from this week and want a chance to win, then share them in the correct thread on our forum, don’t forget to mention the score! Rares go into this THREAD and trophy animals into this ONE. We currently don’t have a competition for Non-Typicals, but they go into this THREAD. The ‘Rare of the Week’ is this very nice Bighorn Sheep which was shot by LeafyIsAwesome. This to many would be classed as a super rare, as lots of veteran players have never even laid their eyes on one. Congratulations! 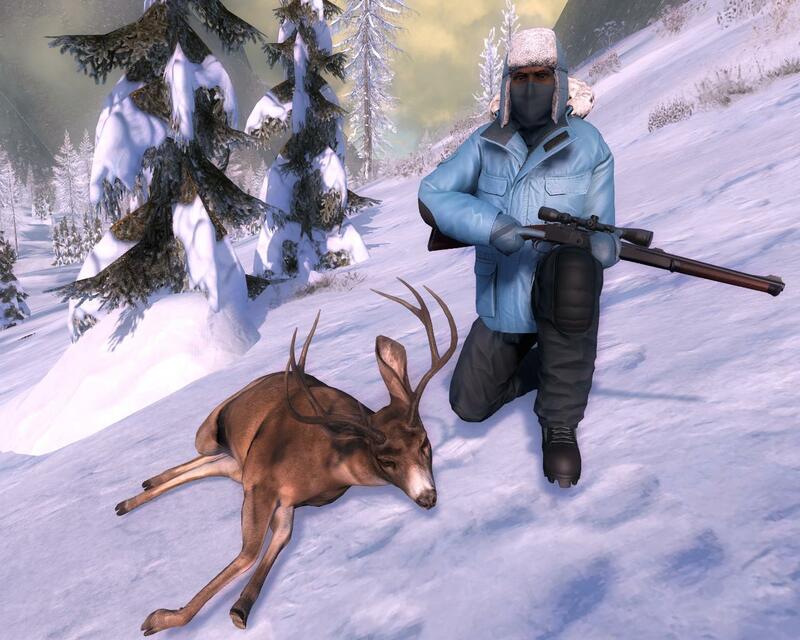 And the ‘Trophy of the Week’ goes to Serab86 for this very nice Sitka deer. It has an impressive score of 109.882. Great stuff! This week’s free rotation lets our guest hunters test their skills against Snowshoe Hares and Rocky Mountain Elk. Polar opposites… Get it? Best of luck out there and I hope you all have a good weekend!